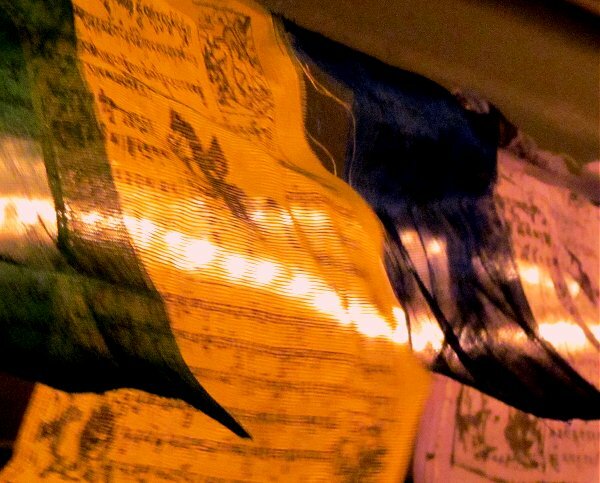 Tibetan Buddhist prayer flags stream outside our house in syncretic celebration of today's Hindu festival of lights - Diwali, and music of the moment is Alan Hovhaness' Symphony No. 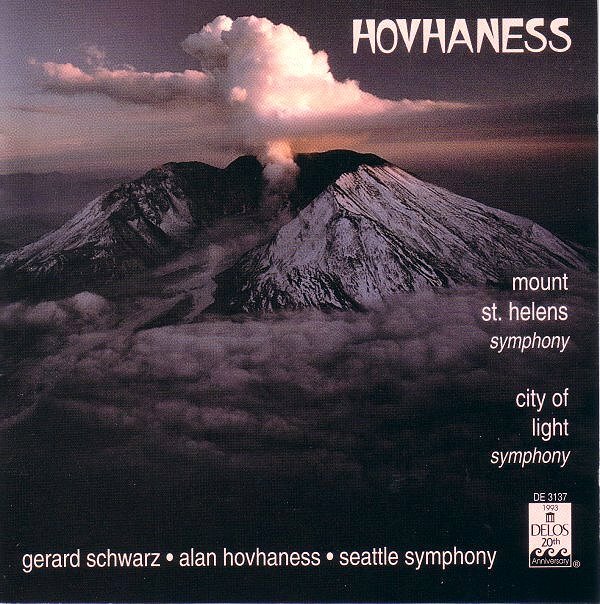 22 'City of Light' in the Delos recording by Gerard Schwarz and the Seattle Symphony. Born in Boston in 1911, Alan Hovhaness's father was Armenian and his mother of Scottish descent. He studied at the New England Conservatory, and was organist at an Armenian Church in Watertown, Massachusetts where his eclectic influences included the composer/priest Komitas Vartapet and, later, the Indian musicians Uday - brother of Ravi - Shankar and Vishnu Shirali. In 1942 Hovhaness won a scholarship to study at Tanglewood with Bohuslav Martinů. But he did not gel with the Tanglewood clique dominated by Aaron Copland and Leonard Bernstein, and the official Hovhaness web site reports that his music was ridiculed by the Tanglewood set, with, allegedly, Bernstein calling it "ghetto music" and Copland talking loudly (in Spanish) over an audition of one of his symphonies. After leaving Tanglewood Hovhaness continued to develop his unique composing style, which was shaped by both Armenian and Indian music. In the late 1950s he was a Fulbright research scholar in India where he studied with Carnatic musicians, and where, in an example of converging paths, he learnt the veena - the instrument of Sufi master Hazrat Inayat Khan. Hovhaness' output from this period includes the All India Radio commissioned Nagooran for Carnatic orchestra, and his Madras Sonata for two pianos. Although Hovhaness' music was rejected at Tanglewood, his champions included fellow mavericks John Cage and Lou Harrison, with Cage supervising the publication of the piano composition Mihr in Henry Cowell's New Music series. With endorsement from a vigorously trending John Cage, and with a strong element of funding-friendly multiculturalism, Alan Hovhaness' relative obscurity may seem puzzling. But the reason is almost certainly the unforgivable tunefulness of his music. Despite Cage's advocacy, Hovhaness receives just one fleeting mention in Alex Ross' influential The Rest is Noise, while in Alan Rich's survey of twentieth century music American Pioneers, his oeuvre is described as "basically a conservative one, deriving much from the more garish repertoire of late-Romantic Russian composers, but often spiced with the long, sinuous melodic lines and rhapsodic rhythms of Middle-Eastern song and dance with the occasional use of traditional Asian instruments to expand the range of tuning". Alan Rich was almost certainly damning with faint praise, but that analysis actually provides a very good reason for reassessing Alan Hovhaness. He was an a contemporary of Benjamin Britten, so how about programming some of Hovhaness' music in 2013 at the expense of the ubiquitous anniversary holy trinity of Britten, Wagner and Verdi? A happy Diwali to all my readers. I love the thought of those prayer flags outside your house, Bob. I offer here just two trains of thought that came to me as I read this post. First, this is not the only time I've been given the idea that Tanglewood compared with Marlboro is by a country mile the less congenial place to be. This is all a speculative comment, but I wonder if it might be that Tanglewood was the more dominated by composers. Busch and Serkin would never have allowed this cliqueishness at Marlboro, and nor now would Ushida and Goode. Given the eminent musicians who have been at Marlboro over the years, I doubt it has ever arisen. Bernstein's reaction to the Hovhaness recording in its entirety was to play a melodic minor scale on the piano and say, "I can't stand this cheap ghetto music." This is rich, coming from a man who as composer and conductor often flaunted his Jewishness. He was very happy to record the works of Bloch. And when he said that to write a great musical you have to be Jewish, gay or both, he evoked at that time two ghettoes. His shocking insult to Hovhaness reminds me of Luigi Nono refusing to shake the hand of Britten at the Dartington Summer School. Composers at war, and at that time they most certainly were. In this case, it is baffling. I suspect that for certain composers AH was variously too Armenian, too melodic, too eclectic, and too prolific. But if so, on two of those counts Bernstein and Copland must have had little understanding of what constitutes 'American' music, for surely the influence of music of other lands is integral to it, and the influences in Hovhaness' music are more than the Armenian. As soon as I read the post, I looked at Music of the Twentieth Century: Style and Structure, by Bryan Simms. No mention of AH, though there is a chapter on Indeterminacy, and AH wrote one of the earliest aleatoric works. No mention of Bloch either, incidentally, so I'm wondering about Simm's grasp of American music as well. So, AH was good enough for Stokowski, Koussevitsky, Sibelius, Cage, Martinu, Lou Harrison, Howard Hanson, Szigeti, the Fulbright and Guggenheim foundations, but not for the strict serialists, which one would expect, yet nor for Copland, Bernstein, Thomson and the rest of the Americanists. As I don't care for Copland or Bernstein, and rather detest Thomson, I'm inclined to say to myself, "Who gives a damn?" The fact remains that Hovhaness was a beacon of independence, his music often magical, and his continuing neglect rather a disgrace.